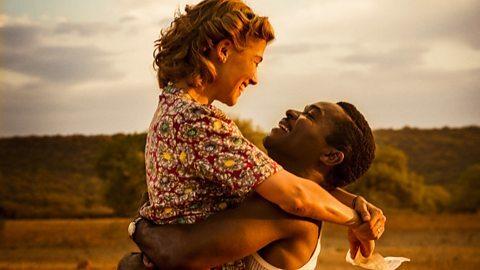 Synopsis: A UNITED KINGDOM tells the inspiring true story of Seretse Khama, the king of Bechuanaland (modern Botswana), and Ruth Williams, the London office worker that he married in 1948 in the face of fierce opposition from their families and the British and South African governments. Seretse and Ruth defied family, apartheid and empire – their love triumphed over every obstacle flung in their path and in so doing they transformed their nation and inspired the world. Director Amma Assante, child actress, screenwriter and director of A Way of Life (2004) and Belle (2013) brings us another outstanding film with an inspirational real life love story at its heart – but also with its fair share of anti-racism, apartheid, societal change, geo-politics and economics. In lesser hands, this outstanding film might have been an overly-sentimental, inter-racial romance but we can trust the director of Belle to give us a sincere and moving love story while spotlighting a shameful period of post-war UK history with no credit to either Tory of Labour governments. 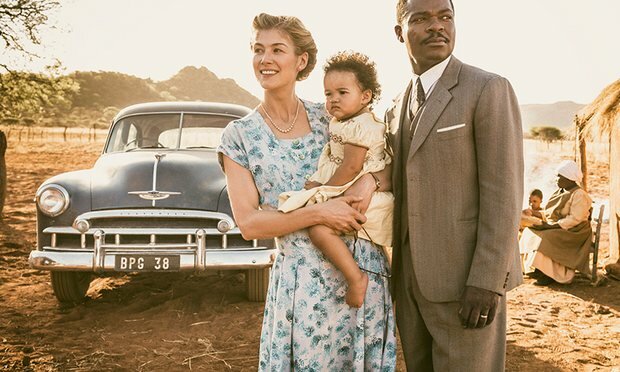 Ruth Williams (Rosamund Pike) is the London office worker who in 1947 goes to a Missionary Society Dance with her sister and meets Seretse Khama (David Oyelowo) born into a powerful royal family in the then British Protectorate of Bechuanaland, who is studying for the Bar in England. The couple soon bond over their mutual love of jazz and start to date. But this is the time when signs like ‘No Blacks, No Irish and No Dogs’ are common in England and when apartheid is being institutionalised in South Africa. Ruth Williams’ father (Nicholas Lyndhurst) objects to the relationship and when the couple marry a year later and go to Bechuanaland it sparks a furore among the tribal elders and with the apartheid government of South Africa. In the starring roles both David Oyelowo and Rosamund Pike are outstanding, ably supported by a superb ensemble. Beautiful cinematography from Sam McCurdy and a penetrating and clever script by Guy Hibbert reflect the passion and political complexities of these real events. One scene in particular may cause a wry smile, when a young Tony Benn (Jack Lowden), who has founded the Seretse Khama Defence Council, argues with his Party leader (Prime Minister Atlee) that Labour should be adopting the policies currently held by the Tories. A United Kingdom – one of this year’s most anticipated films – doesn’t disappoint and is a timely reminder of a shameful period of our history.